Recently while reading and contemplating sacred space, I ran into some amazing information about how the ancients created sacred space. Using numbers and relationships of patterns in the sky and the patterns of the earth, they discovered relationships that are still amazing and awe inspiring. Many of the old structures, sacred sites and the like incorporated these relationships within the buildings that they built on sacred sites. This history goes back thousands of years. I use the term lodge in the broadest of terms. This is not in anyway connected to the traditions of our native elders but rather informed by a relationship of the sun, moon, earth, mercury and venus. These initial movements in the sky and in time spoke of the cyclical nature of time and the needs of planting, hunting and celebrating life. 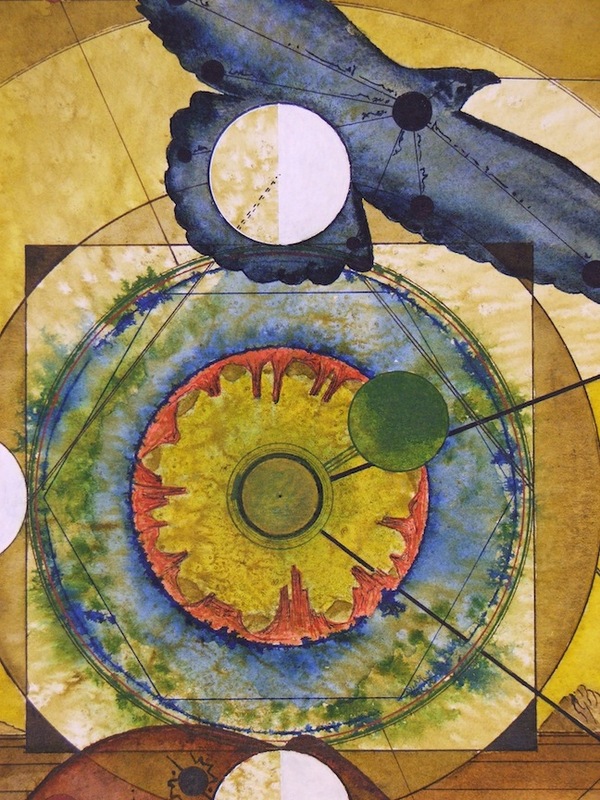 The whole work is created on a very thick piece of arches watercolor paper, 300 lbs. This is almost like board. Constructed of cotton fibers, this material reminds me of the clothing and fibers that were essential living a life out in the open. Cotton was not the first fiber we used for painting, papyrus was and stone is even older… so the surface of the paper is rough and is like painting on rock. But there was no real white, this is a modern creation using chemicals, so often the first layer is just throwing wet inks of a natural color on the surface to allow it to pool and reticulate such that these patterns are beneath the surface glowing through the whole work. I will also limit my palette to a set of colors that interact and coordinate with each other. The browns dominate this work. Sepia, Tabacco Brown, Umber and Red Ocher are all close enough yet distinct and have a stone feel. Added to this, Brilliant Yellows, Cobalt Blue and Paynes Grey allow dynamic forces to come through. White, titanium dioxide, comes from diatoms in the ocean. A tough paint to use because it matts and dulls the overall work, it is always added last. This is similar to the white that often covered temples and sacred grounds. But it is corruptible. Many societies became so obsessed with painting things white that they exhausted the resources of their local area leaving time to return these stone monuments to the elements, trees and time moving on to new locations. This detail is the sun as full spirit. Almost all cultures honored the sun. The source of heat, life, fire and the pattern of the seasons, the sun is the one constant which we all admit fills our days. Early peoples tracked the sun carefully and knew the seasons by the rise of the sun on special ceremonial days, summer and winter solstice, spring and fall equinox. We are just now discovering how many buildings and monuments aligned with this. These ancients were not stupid, by far, they were highly intelligent with record keeping we are discovering and minds that honored this necessary mystery. Hanging on these patterns were planting and harvesting times. The character running lengthwise is a simplification of OM, a prime sound of creation. Built of flames and marks, our language in writing evolved from the simplest of chanting and drumming. Drumming initiated the people into a sacred space and time and altered their perception. Ceremony was a time to release the energies pent up within the normal time and allowing us to recharge our batteries. Earth and Moon Lodges are constructed on sacred spots where lines of the earth cross. These ley lines were directly related to the source of water, springs and the like. Where straight lines were discovered these faults often had energy coming up from below. In extreme cases, like the Oracle of Delphi, gases emerged from the ground and the priestesses would sit atop these vents and speak words of prophesy. The earth pulsed in these areas. If over a spring, there was spiral energies. And these spiral energies involuted and evolved the people in relationship to mystery. In this work, the basic circle is squared. A square for the directions is inscribed with a circle within. 3/11 of a diameter is the circle of the moon. This is the exact relationship of the diameter of the earth to the moon. When that circle was placed above and around the center circle another circle can be inscribed around the first circle using the center of that circle to create this diameter. The circumference of this larger circle is exactly the outer circumference of the square around the earth circle. These maps would often be built up like mountains and temples. The great mandalas of the Tibetans or the diagrams of mount Meru had these proportional relationships in them. 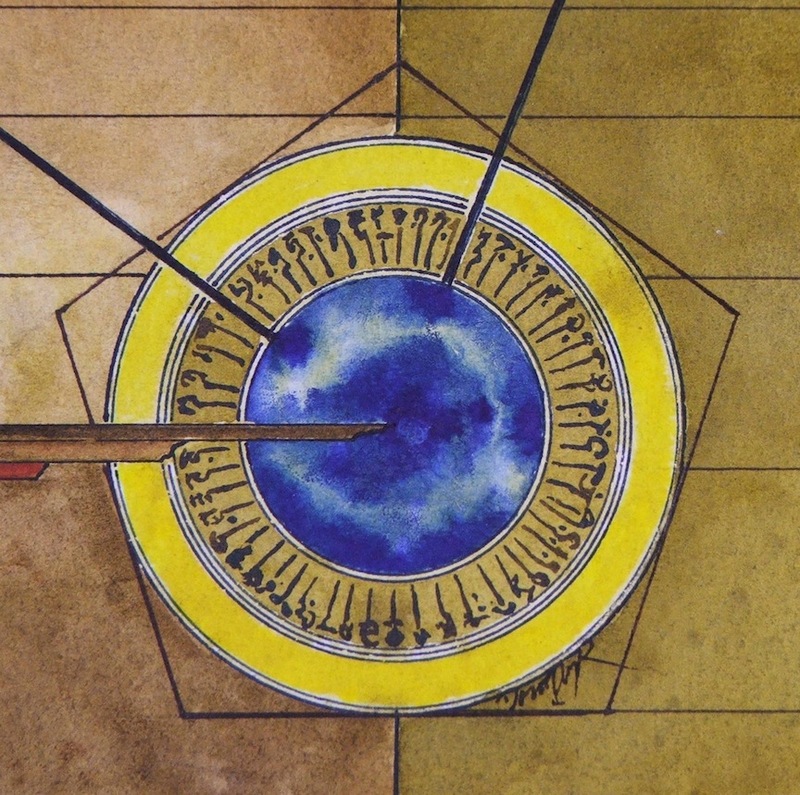 Yes the ancients knew the earth was round, and they new within very precise measurements its diameter and circumference. As well it seams they understood the moon diameter. If one draws a line from the center of the moon atop the earth circle to the exact side of the circle half way, the measurement of that angle is 52 degrees. This is the exact measurement of the great pyramid of Giza. Part of a complex of pyramids which reflect the three stars of Orion’s Belt, this complex is a direct link to the sacred above the earth. These three stars in that time were on the horizon rising as the sun stood still at winter solstice. These people were brilliant! The knew the moon, sun and stars in a manner we have in many ways have lost today. This detail is Venus. A wanderer in the sky, she heralded a long count of time. Within an 8 year period of time she returns to her positions five times and thus back to almost the same place. She was given a lot of honor. To some she was Isis, to others White Buffalo Calf Woman, but to many she counted the cycles of rain and drought. 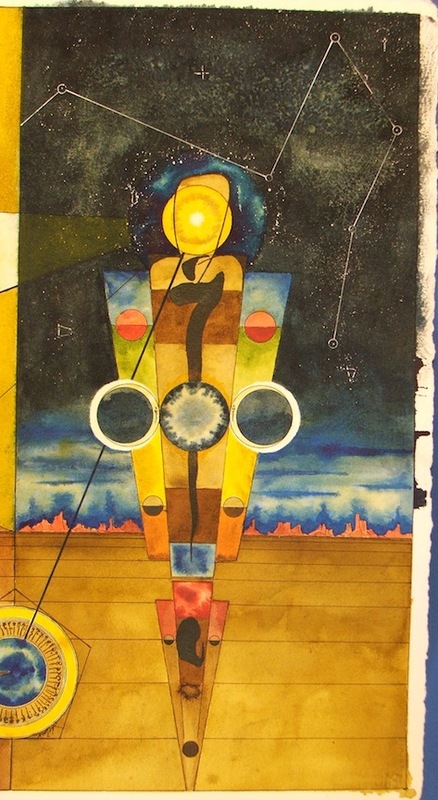 As a bringer of life and cycles within her proportions and relationship to the sun and earth is a very abstract idea of the golden proportion. This relationship is built into so many sacred spots its hard to deny that this ratio is magical. And it is! This proportion can be found in plant life, trees, flowers, even the way mountains erode and have their shape. Observation becomes magical as the mind vaults with this direct experience of the sacred. To the lower part of the lodge is the bear. I chose this symbol for numerous reasons to carry the lodge. 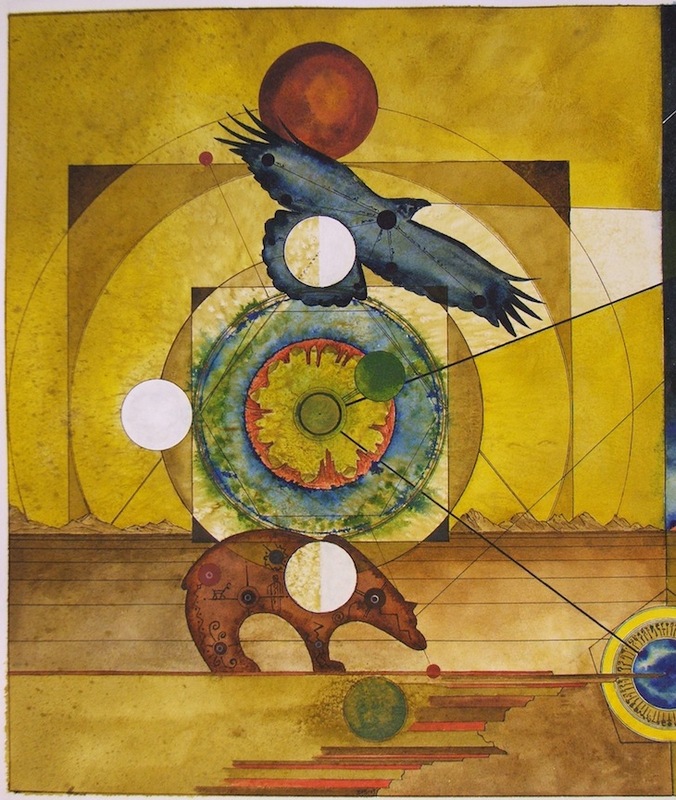 The bear was and is considered the equal to man for the native elders. The bear became the one animal that the natives considered most human. They easily killed humans and at the same time with observation led the healers to herbs and plants necessary for our survival. The bear is also immortalized in the sky as the little and big dippers. To the europeans, the dragon was a mythical animal above all animals. The star pattern of the dragon surounds the north star as we cycle through the year… With his helpers the bear we hold the mysteries of healing and holding sacred space. The bear and the dragon are the active principles of the earth energies of creation. 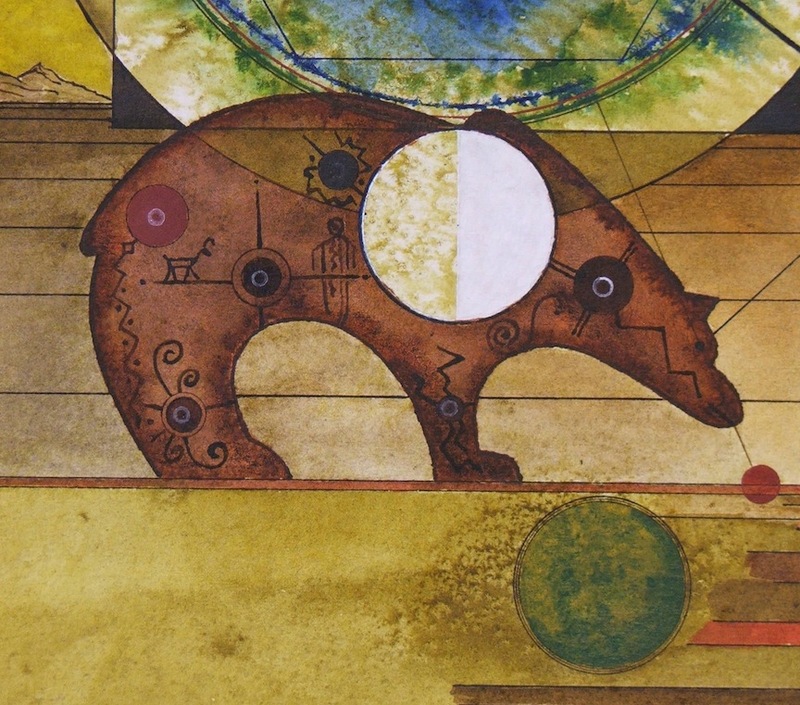 Within the bear are circles and spirals and figures like those drawn on the rocks. When we step back we can understand these pictures for what they were, maps to water, hunting locations and sacred spots. A record and a declaration of what was located near these record stones. The Raven calls the people in ceremony to ecstasis. She flies across the cosmos between the worlds and within our selves to places unknown and unknowable. All sacred spots honored the raven or birds of some kind as the soul, the etheric body, that can dream of new possibilities. 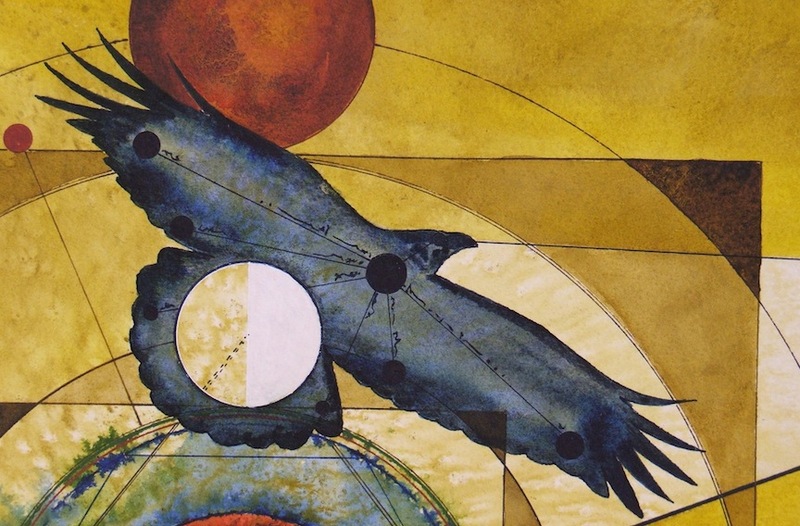 Thus the raven here flies connected to the sun and earth as it spirals to something awesome. The inner detail of the earth hold water and earth, mountains and green growth. She pulses within her core as she relates to those bodies around her. The moon brings the tides without which there would be no life on her. The hexagon harkens to mercury and speaks of the physicality associated with the forms found in crystal structures. Thus the form combines withe pulsing energy of the earth, the tides, the seasons and the long counts of Venus to create sacred space of a lodge. With this we dream our passions. The red moon and the doubling of the circle of the earth and square of the directions speaks of our constant dream of knowledge and passion in all that we do. In the end, it matters not what one believes to be true. Rather our experience of these mysteries, relationships, ratios and cycles gives one a profound sense of silence and wonder that all these things are interconnected. We live in-medes-res… in the middle of things magical and awesome. The work is dedicated to holding all these things as sacred and not letting our understanding outstretch our awe at the beauty of creation. 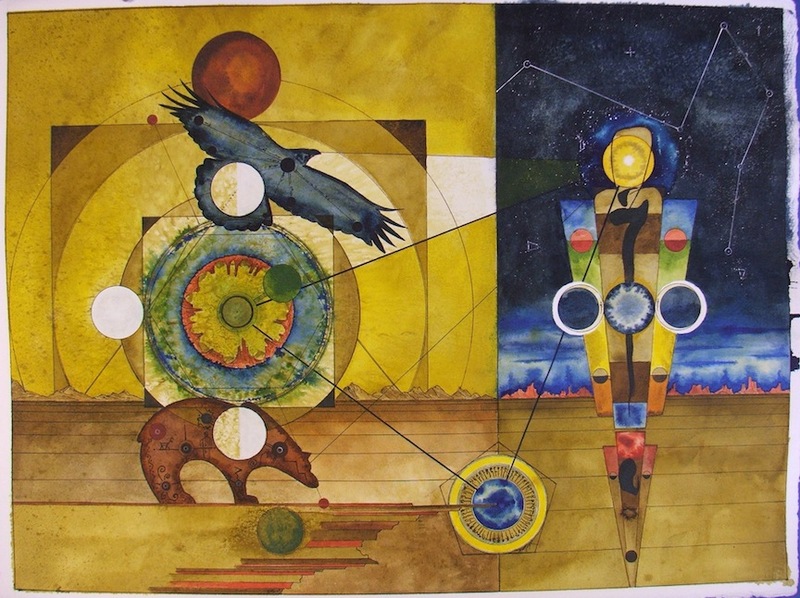 This work is available from http://www.ravencircle.org. Enjoy the mysteries, ancient and new.